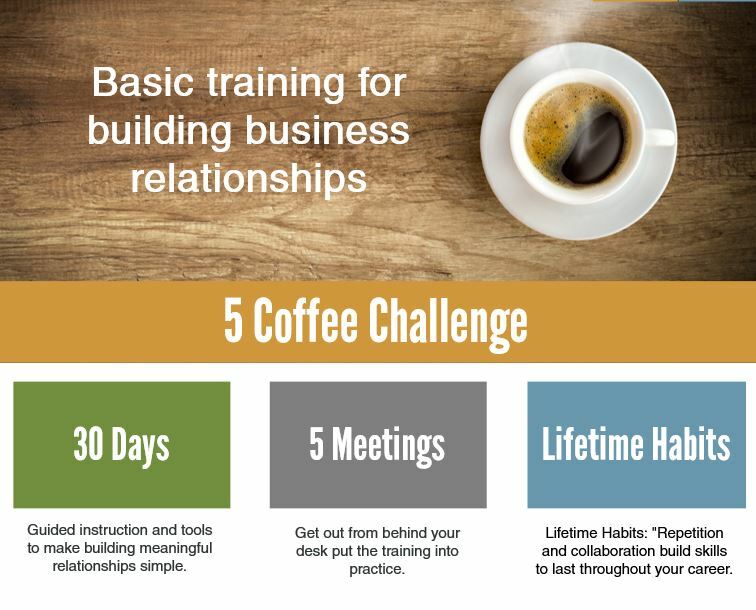 June 23, 2015 _ Law Leaders Lab is pleased to announce the launch of the 5 Coffee Challenge, an interactive training program focused on helping attorneys master the fundamental business development skill of relationship building. The premise of the program is simple: Most lawyers understand the importance of building relationships but aren’t able to commit to doing so in a consistent and meaningful way because they don’t have the time, lack the confidence, or want to do it but just don’t know where to start. Over six-weeks, the program guides attorneys through the basics of identifying, meeting and following-up with new contacts who can help them expand their network of potential referral sources. We provide practical advice, tools and templates to make outreach easy, and a system that keeps them focused and on track. Participants then put these concepts into action, by having participants get out from behind their desk and put the training into action by taking part in five coffee meetings over the 30-day program. The 5 Coffee Challenge program is led by Law Leaders Adviser Josh Beser, a former “Big Law” attorney who is now an associate in-house counsel for a major pharmaceutical company in New Jersey. Beser has not only sat in the shoes of the participants but he represents the voice of the client. Having sat on both sides of the table, his personal experience is something to which participants can relate. The program is designed to be implemented as a stand-alone program or to run concurrently with existing in-house programs. More information can be found here.